This week, we wrap up Black Moon Games‘ Call of Cthulhu draft with Rod’s Agency and Syndicate deck Cops & Robbers and Tyler’s college of sorcerers from Miskatonic University, the Order of the Silver Twilight and Yog-Sothoth. Check out the side bar of this post for both their deck lists. Subscribe to Decked! on YouTube to catch the whole series of games from Black Moon Games, and more live-on-tape card game fun. Black Moon Games‘ Call of Cthulhu draft continues with a match-up between Rod’s Agency and Syndicate alliance dubbed Cops & Robbers and Ray’s Cthulhu / Shub-Niggurath / Silver Twilight deck — the drafting of which has been detailed exhaustively — christened Crimson Serpents. Check out the side bar of this post for both their deck lists. In the first round of Black Moon Games‘ Call of Cthulhu draft, Toby fields Crazy Wizards against Tyler’s School for Sorcerers. It’s Hastur, Silver Twilight and Yog-Sothoth against Miskatonic University and Silver Twilight. Check out the deck lists for both decks. Toby sorted their cards after getting home, so the Crazy Wizards list is an approximation. Some possible other cards included were Nathan Wick and Erasmus Manor. I said this during the commentary, but Blood Magician did amazing work in this draft for me. First it gave the edge in many icon struggles, and then it attracted other players’ ire, using up their resources taking out Blood Magician instead of focusing on other areas. Returning to the Call of Cthulhu draft held at Black Moon Games, Ray goes over the cards he’s pulled and his strategy for the upcoming matches against fellow players. 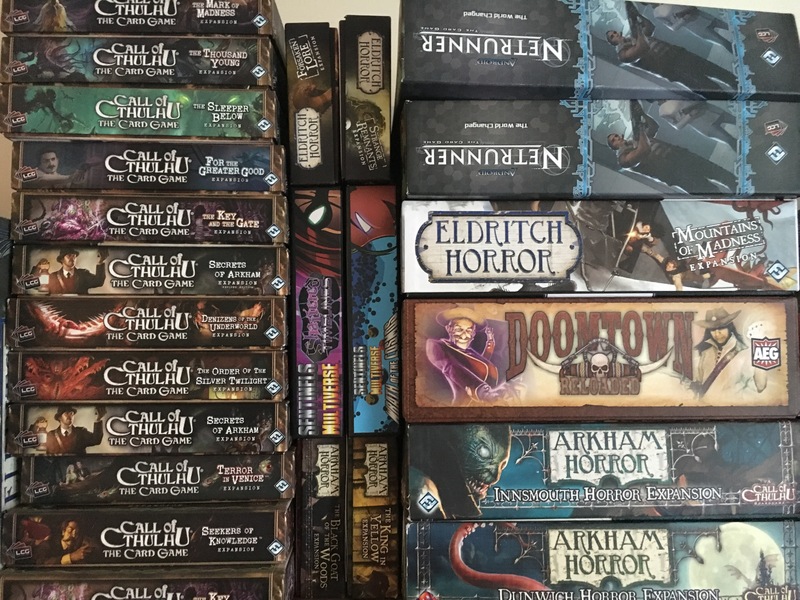 Black Moon Games hosted a Call of Cthulhu LCG draft recently, and Decked! was there to catch the action. Before we get into the matches of the day, let’s look over Ray’s shoulder to see what he selects from the cards offered to him, and get some insight into his drafting process. Subscribe to Decked! on YouTube for the latest in live play videos. This Sunday, Black Moon Games hosted a Call of Cthulhu: The Card Game draft at their store in Lebanon, New Hampshire. Three of us traveled down from Burlington to meet up with three more players, which makes for the most people I’ve seen playing Cthulhu at the same time in one place, outside cutaways in Fantasy Flight’s live streams. After drafting cards, we played three rounds with the decks we built, first with random match-ups, then pairing manually based on the wisdom of de factor tournament organizer Rod. I got three matches on camera for Decked!, so you can look forward to those posts in the coming weeks, as well as an over the shoulder shot of Ray drafting his cards. My hope is for that to become a mini-series, where Ray explains his thinking on his selections card by card, both for himself and with regard to what he deduced his neighbors were doing. As for myself, my first pick was a Syndicate card, Carnivale Sentinel, and then I rapidly realized that I was not be receiving any useful Syndicate cards at all from my neighbors — later on, I discovered both Rod and Carlo had built decks with significant Syndicate presence — so I shifted gears toward Miskatonic University when I got an Alternative Historian and Yog-Sothoth for the affordable cultists and sorcerers. Then Carlo passed me Carl “Goddamn” Stanford, as he’s known locally, and I found myself drafting three factions. My mantra was “Characters win drafts,” as Rod told me once, and I tried to stick to that, keeping in mind cost, icons and useful abilities. Some characters wound up always getting resourced — Richard Pike, for instance, and Magnus Stiles; too narrow an ability and too high a cost, respectively — and most of the support cards wound up feeling like chaff, barring Cryptic Writings — shutting down Henry Knoll at one point, delightfully — and Guardian Pillar proving super helpful the one time I got Unending Festivities into play. Overall, I won two matches and lost the third to Rod and his Syndicate deck. I’m pretty happy with that for my second time ever drafting, especially after tanking so hard the first time. Stay tuned for draft picks and play commentary on coming episodes of Decked! Brap’s Magic‘s recent Call of Cthulhu: The Card Game tournament winds down with Rod’s Avatars going up against the mi-go and their pervasive toxemia. Will the recently discovered Mi-Go Warrior cheese make an appearance? Watch and find out! Subscribe to Decked! on YouTube to catch the whole series of games from Brap’s Magic, and more live-on-tape card game fun.